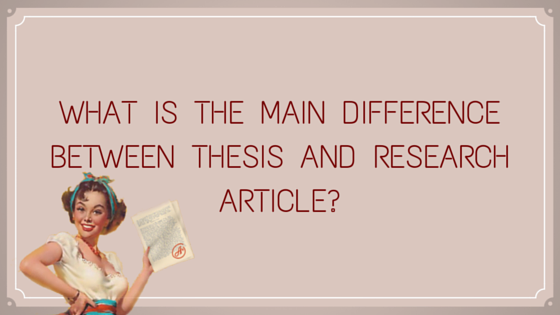 What is the difference between thesis and research article? A thesis writing and research article are very different things, but like a lot of academic endeavors there is a little bit of cross over. For a start they both involve a lot of writing and a lot of research, and there is a good chance right now that a student is doing one or the other and is sat at a desk staring at the wall wishing it was over. Here are a few differences between a thesis and research article. It is a statement that you intend to prove. This is the case most of the time, with the possible exception of a research paper thesis as it is more acceptable for them to be a question. Sometimes it is a question you intend to prove right or wrong, but sometimes it is a question that you can help more people closer to an answer with, but without actually providing an answer yourself. A research article is what? This is where you ask your question and you use your work to come up with an answer or to further human knowledge on the subject. The latter part sounds like a copout, but there are simply things we cannot know for sure, or things we cannot prove as definitely true. What can we not prove as definitely true? The idea that there is more than one universe may be a difficult thing to prove, but research papers of a less grandeur scale are also subject to this difficulty. For example, if you have a psychology research article and you see that a test produces results where 10% are contrary to the rule, then you are having trouble proving something to be absolutely true. If you were to write a research paper thesis or research article on that subject, then you may be furthering the human knowledge as oppose to actually coming up with an answer. You may be explaining a little more about why this 10% contrary margin exists. A lot of essays are just curation of the knowledge of others. One once said that we stand on the shoulders of giants, but the fact is we muddy the giants as we sit on them. We cannot know the material as well as them and therefore frequently get it wrong (with all best intentions) when working from the studies of others. Curating knowledge should not be done in either a research article or a thesis. You may stand on the shoulders of giants, but the idea is that you use that work as a foundation and not as your house. You use their work to reach your own conclusions and answer your own questions. No research article, research paper thesis or any form of thesis should be a simple retelling of the facts. Both require a lot of research beforehand, and both require a lot of research during. Both need a lot of thought at conception, and both need to be justified. A research article will probably need you to justify your research methods, whereas a thesis has less emphasis on justifying your methods. A thesis has a bigger emphasis on what you do with your information. It is possible to write a research article that spends most of its time stating facts that you have uncovered. A thesis paper is going to require more analysis and evaluation in order to prove your thesis point. The same goes for a research paper thesis set out as a question because you are going to have to go at least some of the distance showing how you are mining and interpreting data so that you may answer your question or further human knowledge on the subject.